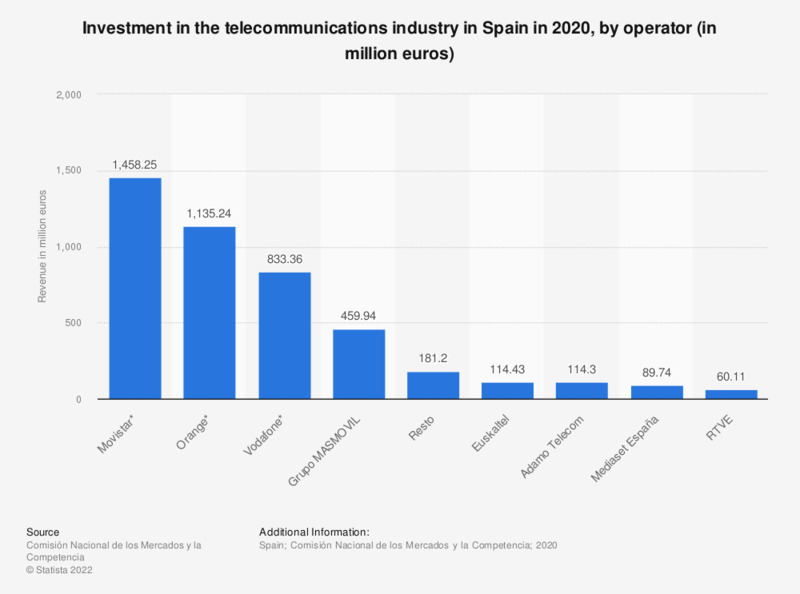 This table shows data on investment in the telecommunications industry made by Spanish service providers in 2016. Movistar ranked first with a total investment of 1.8 billion euros. Ranked second was Orange with an investment of 1.14 billion. The source indicates the following information: Vodafone data includes those from Ono. Orange's data includes those of Jazztel and Euskaltel data includes those of R.
The Movistar data includes the revenues corresponding to fixed, mobile and audiovisual services for the entire historical series, and from 2016 onwards include those of DTS and TAD. The data of the mobile network operators include those of the MVNOs that they own.